The Lord has given me a huge word for the upcoming Lenten season. Lent this year starts on March 6 and goes through April 18. However, Papa is already talking to me about it, and I feel like I’m in Lent already. He’s wrecking me with the cross. 1) For all who are willing to do a 40-day Communion challenge. This is only if you’re willing, because taking communion with a wrong heart before God will kill you according to Scripture. So only do this if your heart is right before God as you take the bread and cup. 2) To learn the place of immunity and boldness. Immunity and boldness go together. When you know you’re immune to harm, you become bold. Like the superheroes of the comic strips, we do in fact have superpowers in Holy Spirit–but we have to know what they are and where they come from. 3) Enter the 7 healings of the cross. Most people have no idea what Jesus did for us on the cross. We certainly have no idea how to appropriate it for ourselves. And yet, Jesus purchased 7 healings for us on the cross–7 representing perfection and completion–and you can enter into those 7 healings NOW if you want to. I can remember specific moments in my life in which I decided to enter into each of these 7 healings. And when I did, my life transformed. Over and over again, I saw huge transformation. Beloved, you need to enter into the victory that comes with the 7 healings of the cross. This is intense stuff that makes me gasp for breath, it’s so powerful. It makes me whisper the name of Jesus to even think about it. It brings tears to my eyes to even write these few sentences about the healings, healings, healings of the cross. Because this is such a jam-packed word, I’m going to teach a webinar on it. It’s going to take me 2 hours of audio/video to teach it well–but you will be transformed if you listen. Webinar cost: $39 per person. 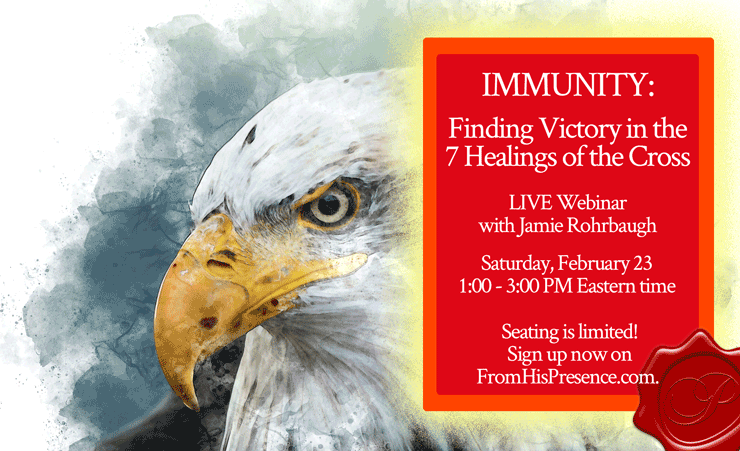 Sign up here for IMMUNITY: Finding Victory in the 7 Healings of the Cross. We only have 100 seats, and I won’t sell overflow seats. I want to make sure that everyone who pays gets a live seat. So if you want to attend this healing and transformational class, SIGN UP NOW. Click here to sign up for the webinar! Beloved, this Lenten season is going to be amazing. It’s only by the power of Jesus’ blood that we are saved and have victory. The Lord is highlighting the cross in the Body right now because we have to understand the cross in a new way in order to see the total transformation He longs to give us. Sign up today for next Saturday’s powerful teaching on the cross, and I believe you will see transformation in my life as I have in mine as you enter into the 7 healings of the cross! Will the package be availiable for purchase after the webinar? My name is Wilma Matthews and I received this word. Praise God my Breakthrough is upon me!!! Thanks for the up-date.i would be very interested in the 40day fast challenge. Kindly advise on this. Will you also give us daily prayer points on the same. When does it start?